Round 5 saw the Hawks head down the M1 to take on Killarney Vale on our quest to start the season 5-0. A decent crowd had formed by 2:00pm, although Adelaide Street Oval was not at full capacity partly because of the fact that crowd favourite, and Captain, Simon ‘The Rat’ O’Brien was a big out this week with an ingrown toenail. In the Rats absence 2nd in command Marcus DeLeur led the boys in to battle. 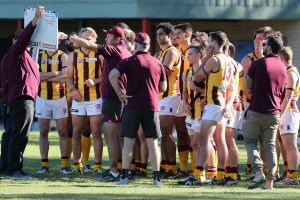 The first quarter was full of hot contested footy, with both sides making a plethora of skill errors due to the immense pressure being applied from both teams. 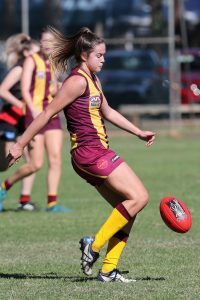 Young Lauchie Price opened the Hawks account early on with a silky left foot grubber. 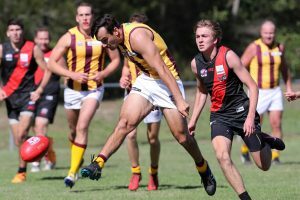 Pricey has been in red hot form the past 5 weeks and the pressure he brings to the forward line as well as his ability to create goals out of nothing is giving opposition backmen huge headaches. Cardiff’s backline on the other hand, have been in superb form; Doc, Zac, Jakey, Chad, Lauchy, Carey and Dave have been working extremely well together, creating havoc for their opposition forwards and taking orders from their Backline Coach and resident pest Jack Pratt.A low scoring first quarter saw 2 goals apiece when the siren sounded with Pricey snagging another just before quarter time, giving the hawks a 1 point buffer going into the short break. The second quarter was much like the first, an even arm wrestle with both sides kicking 3 goal each, one of which was 3rd gamer Nelson Brown’s half-volley soccer goal which looked great from the sideline, unlike Nelson’s moustache. The Hawks midfield was having a great battle with the Bombers, being led by stand in Captain Marcus, bowling ball look-a-like Bryce Graetz (The most improved and dominant midfielder in the comp, according to the BARTV boys) and that real annoying Pratt bloke. When the siren sounded for the long break the Hawks were in front by 5 points. 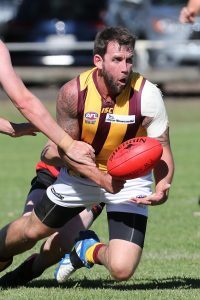 The 3rd quarter belonged to the Hawks with the boys kicking 6 goals to Killarney Vale’s 2. 1 goal to Yensch, 2 to Josh Murphy including a bicycle kick over his head which would have been useful 3 hours later at McDonald Jones Stadium, and 3 goals were from pocket rocket Lauchie Price which gave him a modern day “Bag”. His third for the day was from the same spot as his first two, a brilliant left foot snap at full pace. His 4th and 5th goals were, believe it or not left foot snaps, this along with Pricey missing a few gettable set shots prompted Marcus to question whether Pricey was actually capable of kicking a set shot drop punt. Pricey said ‘of course I can!’ and his 6th and final goal of the day in the 4th quarter, a set shot drop punt from 25 out, proved to Marcus that The Price was Right (zing). A great team effort in the last saw the Hawks kick 5 goals 2, and only allowed the bombers to kick a solitary point. Gibbo chipping his tooth again and turning his million dollar smile into one worth about $3.50. Pricey’s bag which took up 90% of this match report. Having to drive Dave O’Donnell home. A perfect day for footy, and an even better day for a Grand Final rematch between Killarney Vale and defending premiers Cardiff. Cardiff left the nest with a spring in our wings after easily taking care of Gosford, Warners Bay, and Nelson Bay. The trip to Adelaide Street was always going to be a different and harder challenge. Killarney Vale came out firing the first 15 minutes of the quarter with great on ball pressure, intensity, and the ability to win the contest and clearances. It was compounded with the fact we were fumbling, making uncharacteristic errors, and had trouble putting passages of play together. The last five minutes of the quarter we started to find or fit and stayed in touch with the fired up bombers. The second quarter was the game changer and in essence determined the overall result of the game. 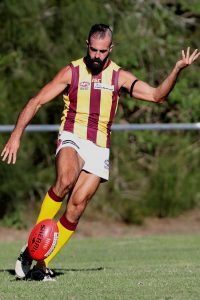 The Hawks kicked 7 goals straight thanks to Grand final hero Aaron Wivell, Comeback kid Cam Jones, and the forever reliable and consistent Mick Ryan. Our forward pressure was helped by great midfield running from Adam Perkovic, Tom Lashlie, Toby Marchart and Zander Cross, while John O’Regan and John Ryan were solid again at the back. Sam Burgess played his best game of the year from the back while Zac Moore was clinical from the back pocket. The third and fourth quarter resembled the first with lots of pressure, patches of fumbling play and many missed opportunities for both sides. Despite the messy play it was good to see the hawks get the points in an arm wrestle in what was at time a frustrating game. When we communicated, linked handpasses, and took the right options the footy was flowing which led to points, on a day where the opposition tested us. Good luck to Tane who felt the full force of Cam Jones and snapped his collar bone in an ugly collision. Hopefully Cam will be back on the field soon too as his shoulder popped out after going for an overhead mark. 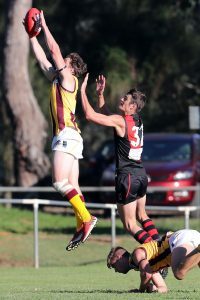 This week the birds once again flew down the m1 to the central coast, this time we faced Killarney Vale. We had a real positive mindset going into this game. And that is how we started. It was a really positive start for us and we matched the bombers early and gave ourselves a few early opportunities and soon enough Courtney scored our first goal. Nothing in it at quarter time. To stay in the game. Our mids were outstanding led by Nikki and Abbey with Tayla G , Claudia and Taylah W all making massive contributions. Still close at the main break, however, we are behind on the scoreboard. Third quarter and we are right in it. While the mids were toiling away they were by no means on their own with Ellise, Faith and Shez keeping our defence in order. Our junior star, Mattise was showing what a class act she is and holding her opponent all day, ignoring the verbal threats that usually come from someone who has been well beaten. A goal to Taylah W keeps us in the hunt. Last quarter was a real gutsy effort as the birds refused to lay down once more. 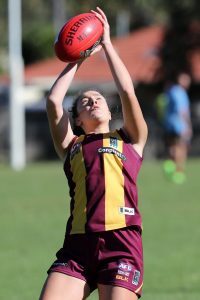 Led by the very talented Bailey sisters, who are growing in confidence every week, Eva and Minni started taking some strong marks and getting the ball moving forward. Another goal to the birds and we’re coming home strong. Unfortunately, despite our very best effort and our never say die attitude, we fell agonisingly close to grabbing our first win.